Constantin Belinsky, the Godfather of French B-movie action posters — and a frequent contributor to our beloved Kitchen Sink section — once started out with a very clean, elegant look for his posters as seen below in this early 1950s affiche. However, possibly upon realizing that popular artists of the time such as Bernard Lancy, Henri Cerutti, and Herve Morvan had already perfected that look — he invented his own colorful style, thus moving onto bigger and bolder designs! 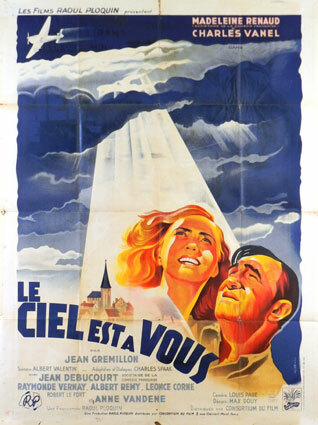 This entry was posted in 1940s posters, 1950s posters, Artists & Illustrators, French movie posters, Romance movie posters and tagged bernard lancy, constantin belinsky, french posters, henri cerutti, herve morvan, le ciel est a vous by russ. Bookmark the permalink.